Maybe I should qualify that – I love Italian opera……. But please, don’t hold this against me – I just discovered at an impressionable age that opera has the ability to be ‘more than’. Take any emotion you can think of: falling in love, falling out of love – pain, hurt, jealousy, broken heart, lost love, betrayal, death – and then multiply it by ten and you have the heights and depths of emotion the operatic aria can take you to. It will wash you clean if you listen at just the right time in your life! Of course you have to suspend any association with real life. Very often when the voice is mature enough to sing the role, the singer is past the first flush of youth and most operatic leading characters are young and nubile ….. I remember seeing Pavarotti at his heaviest playing the the mighty Egyptian soldier Radames in Aida. He stood stock still, centre stage, like a rotund statue while the entire cast moved about him. But oh that voice! In this day of filmed operatic singing it is hard to stay in the moment when chests are heaving and mouths are working overtime to get those notes out. You have to so admire opera singers, they have to sing and emote at the same time. It works much better when it is on the stage. The lighting, set and costumes – the vivid colour and acoustically perfect orchestra and soaring voices take over and the distance between you and the on-stage performance allows for the suspension of belief – one can be quite transported by the event. Because of course the other thing about operas is the sets and costumes. One should never simply listen to an opera – it is a feast for all the senses. Rich in colour and grandeur and theatrical presence. The orchestra and voices soar and mingle with the colour and movement – it is a sensory explosion. Not everything about operas is good. Many of the stories are just plain rubbish really. Sometimes the music misses the spot. But, just like modern musicals, every opera has at least one ‘hit tune’. And when aria and the emotion collide it is indeed a spectacular thing! Even if you have never seen an opera and even if you have and say it’s not for you, I’m sure you will be familiar with these wonderful pieces. Have a listen as you read on. This is one of my favourites, a chorus from Puccini’s ‘Madama Butterfly’ – even if you know nothing about the story, you cannot help but be taken into the tragic denouement. The Hebrew Slaves Chorus from Verdi’s ‘Nabucco’. Can you hear the hopeless exhaustion throughout this hymn of loss for their beloved homeland? From the opening ‘Va pensiero’ I am always caught, no matter who is singing. I recommend biggifying this, and just enjoy – it is great example of staging and emoting while singing……..
One of the most popular operas today is also, in many ways, [and purely in my opinion, you understand – feel free to disagree] one of the worst operas of all time. 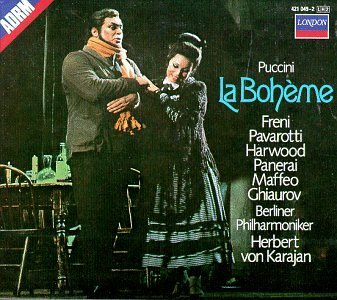 It’s another Puccini opera, ‘La Boheme’ and it is in part, truly terrible! The plot is all over the place and some of the music is less than memorable. But there is a lovely romantic story running through it and it has to be admitted, I love a good romantic tragedy! The real story is about Rinaldo, the writer and Mimi, the delicate embroiderer who lives above him. All the rest just tends to get in the way. This is one of the versions I have on DVD…….. There is a knock on the door and Mimi enters. Mimi is a neighbour living in the upstairs attic, a poor girl who embroiders flowers for a living. Her candle has blown out and she has come seeking a light. Subsequently she loses her key to her door. Rinaldo, the writer, goes with her to look for the lost key. The sneaky beggars finds it and pockets it without Mimi seeing. Moment later he is declaring his undying love. They get together, then he ditches her claiming he can’t stand her cloying jealousy but confides in his friend he thinks their poor living conditions are making Mimi ill. [Why he thinks kicking her out will make her better is beyond me and just another hole in the story.] Many scenes are out in the snow to ensure you get the ‘frozen’ message. Mimi coughs dramatically whilst singing beautifully and with her last remaining strength comes to find her lover again. She dies in his arms. Despite all my cynicism I always shed a tear! Now the upshot of all of this is that even though I dislike the story – just between you and me, I feel I could have written a much better version ……. when the music is good, it is very good – in fact touchingly beautiful. This is why it is one of the most popular operas after all. And I admit it is the romance, the bohemian lifestyle, the starving artist in a garret syndrome that has me in its thrall. I am such a sucker for romance! Did I say that already? And bohemian artists in garrets …… sigh! So when I had the opportunity to rescue some black fingerless gloves from the landfill because they were imperfectly finished or had minor faults and began to play around with them of course the very first thing that came to me was this aria from La Boheme ‘Che Gelida Manina’ loosely translated as ‘your tiny hand is frozen’ which Rinaldo sings to Mimi right off the bat! I played around with colour and made Mimi many mittens so her hands would be forever warm. To accompany the theme there are little darned patches in some of the gloves, whether the mitten needed it for real or not. These are true bohemian mittens, colourful, different and ever so slightly well worn looking. 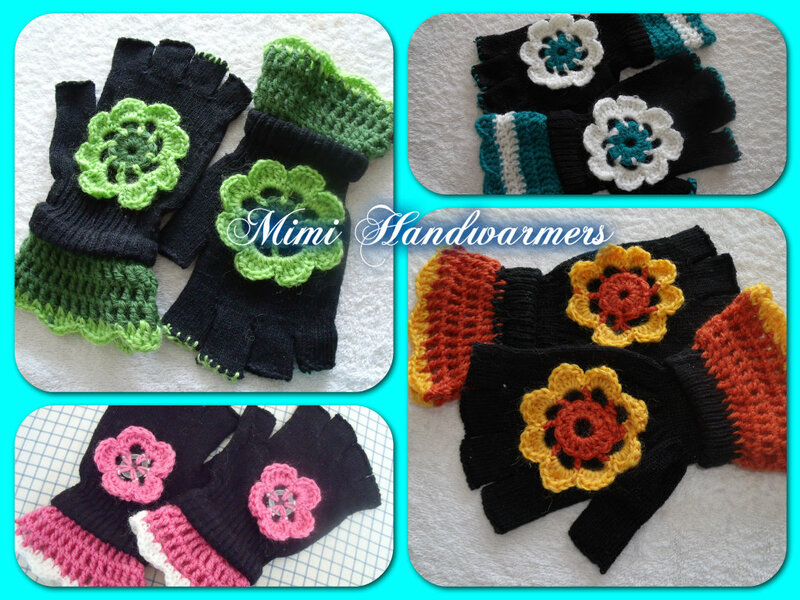 Mimi Handwarmers have flowers on the back. La Boheme do not have flowers, they have a fancy ridge instead. While the black gloves are made using acrylic yarn the additions are made with New Zealand wool or kid mohair. Every pair is different because I make it up as I go along. I am enjoying making them and enjoying knowing something has been saved from the landfill and given the chance of an appreciated and fun life on someones hand. I am giving these mittens away. There are six pairs of handwarmers. However, I’m sorry to say, you do have to pay postage if you want to win a pair – my funds won’t run that far. * If I find I can get it sent to you for less I shall reimburse the difference. Also mention your first and second colour and style preferences in your comment. Even if you don’t want a pair of fabulous Mimi Mittens you can still leave a comment – you know I love to hear from you – I know bohemian isn’t everyone’s style! At the end of the week I will draw names and publish the winners. You will then have to contact me via the address on my ‘Contact Me’ page to make arrangements for the payment of your postage and to give me your address. Thanks for coming by today, I love that you did! 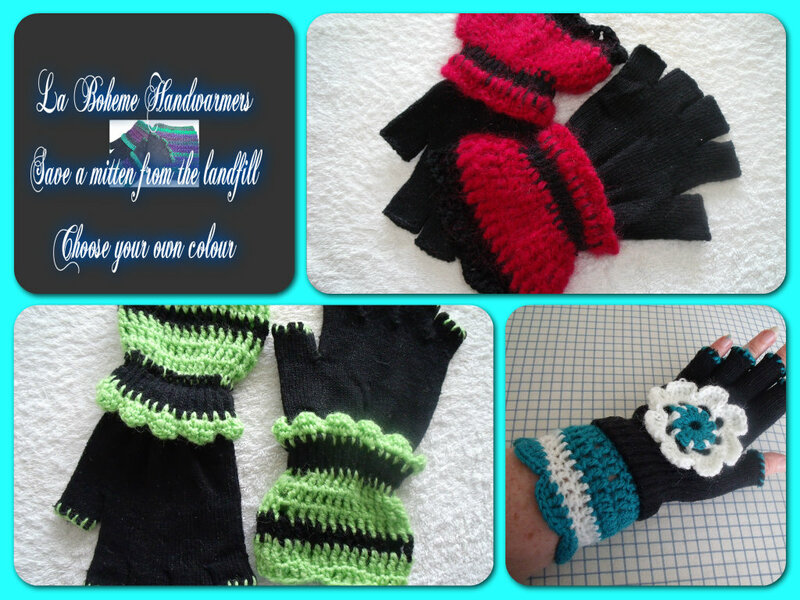 This entry was posted in Creations From My Craft Room and tagged crochet, fingerless gloves, giveaway, handwarmers, La Boheme, mimi handwarmers, mittens, opera, recycling by thecontentedcrafter. Bookmark the permalink. Pingback: Presents from Pauline: Lucky Me! | Love Those "Hands at Home"
Hi Christi – thanks for cming by! I’ve been wondering where you were 🙂 Glad to hear it’s been busyness with visitors. I hope you had lots of fun and good times! The mittens are beautiful. 🙂 Opera is marvellous but in our family it is my daughter who is the true fan of opera. Her passion is for Wagner. When she sang at home, our Jack would sing along ( a counter-tenor, perhaps. 😉 ). Does Siddy enjoy opera? 😀 Hmmm….it does sound as though Orlando may be the musical one. I’m not familiar with opera. My husband keeps trying to get me to go see a performance, and I suspect he will talk me into it one day. My vote is with Orlando. I’d much rather listen to The Boss (who is from my home state of New Jersey), and the Big Man sure could wail on that sax. He’s greatly missed. I saw him in concert once or twice on his own (probably during that time Springsteen and the E Street Band took a brief break from each other). Your mittens are so beautiful. Both styles are lovely, and I particularly like the shade of green you used. Oh goodness Robin, I haven’t been back here for a while and missed your comment – and some others too. Apologies!! I love that you got to see The Big Man – I nearly did once but then couldn’t raise the funds and missed out! Cie la vie! I was happy to see his son playing in the band in a clip I watched a while back. I am happy you like the mittens, thank you! “It will wash you clean if you listen at the right time in your life.” You are a poet. That is an evocative and compelling way to describe this art form, and you have made me understand it a little better just with your comment. You, my friend, are biggifying opera for me, ha ha. I have had very little knowledge or interest, but your post is making me reconsider. Well then, my work here is done! 😀 It is not an easy art form to understand – it is not ‘easy listening’. It requires our attention and a certain commitment to see it through. It’s a bit like seeing Arnie save the world [again]. You know he couldn’t, but in the spirit of a good Hollywood sci-fi fantasy you go along with it. I would be so interested to hear your response to any listening/watching you undertake. I recommend seeing the real thing on stage in a full blown production and I’m betting you would be hooked! I am sure you are right. And if I do see an opera, you can bet I will write about it! I like the passion and the drama in opera. 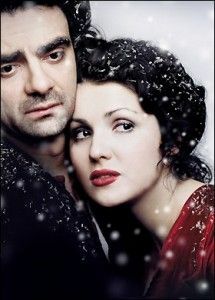 I also like “Madame Butterfly” and “La Boheme.” I agree with you, Italian opera is the best! smiles! My parents helped me to enjoy the silliness of operetta, like in Gilbert and Sullivan’s funny ones. (“Pinafore” is my favorite one of these.) This is light-hearted and totally different sounding music, Pauline. I can imagine you enjoying the lighter side of Gilbert and Sullivan Robin – their operettas can be quite dun. I have to say it is many, many years since I have seen one though – maybe one day I’ll go again! Pauline, what a lovely blend of opera, your artistic talents, the cleverness of rescuing fingerless gloves for Mimi and those lucky enough to grab a pair. Delightful. I’m glad to learn something new about you as well. I have come to appreciate opera more in my later years, but I can’t say I’m a fan the way others are. I admire the talents and enjoy some of the pieces, but I find many of the pieces bring me down. Does that sound absurd? Your gloves are a delight. I’m smiling thinking of them all traveling to a new home. Music has such a profound affect on most of us, doesn’t it? My oldest son has audio processing difficulties and will tell you he ‘hates’ music. It used to completely overwhelm him which makes me sad. We understand him better now, but my days of playing loud music at home are a thing of the past. I feel for both you and your son – while I have no clue what it must be like to live in a music-less world, I have a tiny inkling of what it is like to be deeply sensitive to external stimuli. I notice you used the past tense – does this mean he can now bear some hearing of music without becoming overwhelmed? He is doing much better after a two week intensive called AIT or Auditory Integration Training. It helped improve his processing which was off the charts in the wrong direction. He would never choose to listen to music, but he no longer needs to cover his ears. When he once had to do an assignment for school he discovered that country western music was the most tolerable. Ironically, it is one of my least favorite types of music to listen to. I like pop, jazz, new-age, classical, theater tunes and can even handle some rap, but country falls to the bottom. Conversely, I have many friends that love country music, so it’s difficult to know what our preferences are about, how we hear or what we first experience. Pauline, I look forward to talking with you at length about teaching and your educational system. We have a long way to go in this country toward helping children who learn differently. My friend Liz, the one who relocated to NZ, tells me that children are an important part of society and treated with tremendous accord. I look forward to hearing more from you. I think most parents and teachers are opinionated. There is so much at stake. It’s not necessarily a bad thing. I just wish the process of fixing things wasn’t so long and ardous. I can fill your ears with stories of special ed nightmares here and so can Julia. I’m interested in hearing more when we visit. I could write several other posts Sherri, all about my love for of rock and country and Gaelic and then Cohen, Van Morrison and Eric Clapton 🙂 Then I’d move onto Josh Grobin, The Three Tenors, Vivaldi and Mozart. I’d probably do one on Kris Kristoffreson, Johnny Cash and Waylon Jennings. I’d toss Natalie Merchant in and of course there would be Jackson Browne …… and I couldn’t forget Bruce and the E Street lot! Music is wonderful and there is always something new and exciting to listen to! There is very little I don’t like and I understand most people’s music lists. You have created a true interactive post! I got to listen to music, participate in a poll, marvel over your creative mittens, and learn more about La Boheme. I’ve watched the movie Rent and listened to the soundtrack so many times, but have not listened to the opera. In fact, I’ve not been to an opera, but I love the dramatic, sweeping music … so emotional, so powerful. Thank you for bringing such joy to the WP world today! It was Popstar to Operastar. And it was terrible! I guess just the one season says it all though! Firstly, Pauline, you truly are one of the most talented artists I’ve had the pleasure of getting to know. Your skills and creativity know no bounds. Puccini is my favorite, although very much like you, I could say the same for much of all the Italian operas. When my children were about 6 and 9, I took them to see their first opera at the Metropolitan in New York. About an hour into the production, my son (6) turned to me and whispered, “When will the talking part begin?” I wanted to squish him. He sat through 3 hours. 😀 You are such a wicked woman! 😀 Your children are most fortunate to have such a mother – cultural exposure and wicked humour! I have to say I wondered the same thing when I saw my first opera but I was way older……. Obviously with such an educational experience behind you, this means you can sing! I grow just a little green! While I am sure I would be absolutely splendid at the emoting and passionate rendition part, I’m rather afraid reaching any correct note would be more a matter of pure luck than musical ability. Opera is something I need to experience to appreciate. My father in law was a fan and had promised to take me to one to begin my education but sadly he passed away before we got around to it. So as far as I’m concerned, it’s still out there waiting to be discovered. Love your bohemian mitts Pauline, and I’m sure my nieces would, too! I lived in Dublin at the time of that World Cup (Italia 90) and Ireland qualified. It was amazing how a whole country could stop for a game of football! I came across Rolando Villazon when he was a guest judge on a TV show here where they taught celebs to sing opera. Ludicrous really and it was only on once! Love opera, LOVE Rolando Villazon, Love your mittens. I was at my most impressionable (ie a teenager) whenmy paternal grandmother exposed me to opera. Loved it ever since. 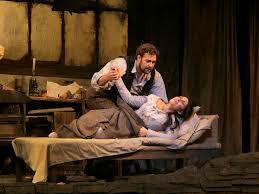 I also love operatic singing a la Andrea Boccelli. I once saw the 3 Tenors when they did an open air concert in Bath. It was 13 years ago and I got tickets to watch it on a big screen in the park next door to the concert. Amazing. It may be a cliche but whenever I hear Nessun Dorma or Granada it just makes the hairs stand up on the back of my neck. I would be very happy to receive a pair of your mittens and would probably gift them to either my godson’s 13 year old sister or my niece because they both like very pretty gloves. Enjoyed taking your poll! Wow! you have just made my Sunday morning rock!! Rolando Villazon not only looks the part but can sing too – I’d love to see him as Heathcliff ….. 🙂 I was a little older when I met opera but it was at a crucial life moment and had a huge impact. I was living in the UK when Nessun Dorma crossed over to become a pop hit due to the World Cup and I credit that with bringing opera closer to the mainstream. I saw the Three Tenors on TV at that time and immediately became a fan! Pavarotti did a concert in Hyde Park soon after all that furore with the World Cup and it was a hugely popular success. I couldn’t go for some reason or other and have always been sad I missed it. I shall toss your niece and godsons sister into the draw too – let’s see what happens! You don’t have to do that! There are loads of folks who want your lovely mitts! You are so fortunate to have Covent Garden on your doorstep! 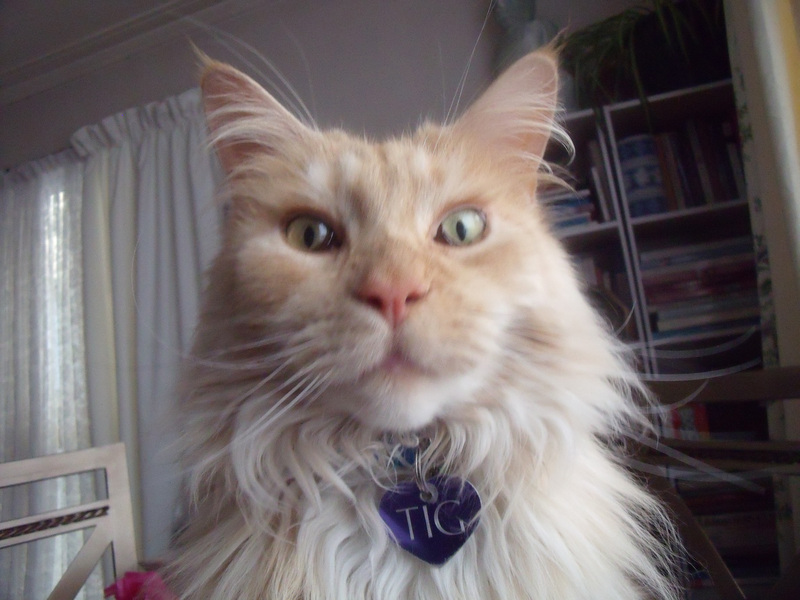 I saw ‘Cats’ at the West End and that was about as close as I got to Covent Garden during my sojourn – except for visiting the market several times which I loved! I agree – a nice colourful pair of mittens will allow you to work and have warm hands at the same time! I wear fabric ones in the summer and woolly ones in the winter while painting – it is lovely and helps keep the fantasy alive ……. Thank you – I agree with everything you said! Although having said that I know I sometimes miss commenting on particular bits because I have so much to say about something else – Sigh! This is the drawback of being opinionated! You’ve done a wonderful job of saving the mittens and putting them into the context of opera. While I have never seen a live opera performance, I’ve watched many on television. I prefer the Italian operas, but I also very much enjoyed Wagner’s The Ring. Glad Orlando got his Bruce S. moment. Hugs and kisses to Siddy. Hope you are feeling well and the cut is healing. I am back in form I’m pleased to say and all is well in my world 🙂 Thank you for asking. I’m with Orlando . . . give me Clarence and his sax over opera any day. Love how you’ve re-purposed those mittens. I think most people are – even I have to be in the right mood! I miss Clarence! Hey Pauline, how’s the eye? I have to say I have never really gotten into Opera. I don’t think it helped that me and my friend went to see a local low budget production of Madame Butterfly and it really wasn’t great. I have book marked your clips though and will watch them over the weekend as I would love to be converted! You are in the draw! I had a listen to the clips, they are very beautiful, I particularly like the humming one from Madame Butterfly, it’s very soothing. 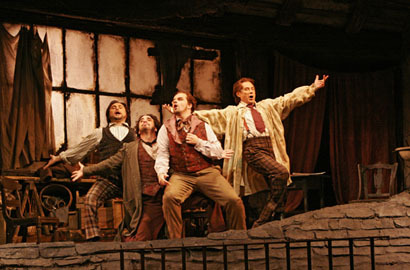 I have book marked La Boheme to watch another time. Thanks for the tips, I think I may get over my bad opera experience and learn to appreciate it properly! Thank you Sharon! You are in the draw, so good luck! I love opera too. I love Verdi and Puccini, but also love the opera Carmen. I once saw it locally, in the round, with real horses. It was magnificent. Oh, and there’s The Nun’s Chorus which always makes the hair on the back of my neck stand up. I’m quite smitten with Leslie Garrett and have several of her CDs. I love her voice. Nice idea with the mittens. They’re really pretty. You know that I’m an eclectic person, but can you believe I’ve never attended an opera. Not sure how I would react when the high notes from the ultra soprano’s crack the lens in my glasses. You should put it on your bucket list Frank – just for the experience! As a person of Italian descent it seems kind of wrong that you haven’t fitted one in yet. Though I don’t recommend La Boheme – perhaps try Rigoletto………. Will keep that in mind! What a wonderful education I received today. I know nothing about opera other than listening to Andrea Bocelli or Pavarotti. There was very little exposure to music in my life but I love most of it. The gloves are lovely but probably wouldn’t used them. You did a beautiful job of them. They look so whimsical. Thanks Jill, I’ll let O know when he wakes up – he had his Springsteen hit, a dance, his dinner and he is now comatose! Beautiful post Pauline! I do believe the way you feel about opera is how I feel about jazz (have you watched the movie ‘Whiplash’). I love almost all music but jazz ‘washes me clean’ (love that!). I admit to having tried to sit through an opera (La Boheme in fact) – and failed miserably, yet for some reason hubby and I go to the ballet and manage that quite happily….go figure. I have seen the movie Whiplash – thought it was an awful and amazing story – and the fact that he really played the drums too just blew me away. Not surprised about your experience with La Boheme! It is beyond me why it is so popular – or why I have two different versions on DVD! What a lovely description, Pauline. I am not a fan of opera. Perhaps, it will come to me at the right time of my life and I will gain an appreciation for it. Perhaps, I haven’t been exposed to it enough to understand its beauty. With the countless offerings on the Internet, I ought to avail myself for the experience. I shall start with the ones you included in this post. About the mittens, they are simply gorgeous. I like how you have turned this “throw away” into such beautiful, creative accessory. I was never exposed to classical music either Elaine and my accidental discovery of opera is quite a story – and then I set about teaching myself about it when I discovered how it moved me. If you get the chance to watch Madame Butterfly in English or with English captions it could be a good place to start. I love Nabucco and Aida too. La Traviata is an easy to watch and popular one also. Glad to hear you like the mittens – thank you! Congrats on your first year blogging, it seems like so much longer that you’ve been here. I hope you are healing and feeling much better now..
I’m with Orlando, Opera has never grown on me. Your mittens are amazing, you sure did improve on the original design. I do have to pass on your generous offer, the cold here combined with arthritis in my hands means my fingers must be covered and gloves don’t work it has to be mittens where the fingers can rub together to stay warm. It is so much longer Lois, it’s two years 🙂 But that shows you read all the way through, so thank you for that! If I ever make some proper mittens I’ll send you a pair! Orlando is saying, “Terrible stories! The soprano always dies! YEOWW! !” Well, maybe. You’re right, the music is glorious sometimes and much of it is woven into our culture so that people know the songs in spite of themselves. I love the gloves, especially the Boheme gloves with their ruffles. But I like both styles and in particular the green. The red and orange are nice, too and I like the way they’re long and go up the arm. Goodness. I may have to bookmark some Youtube operas…. Oh, my mother would love you, Pauline! Opera has been one of the central passions of her life since she was a teenager–I grew up with the sounds of Carmen and the Barber of Seville and Madame Butterfly. It never captured my fancy like it did hers but you’re so right that there are moments of stupendous emotional power in the perfect aria! I think it’s pretty darn cool that you’ve translated your love into the mittens–what a great inspiration! They looks beautiful! I like the ones with the fancy flounce the best (not really a flower type, I guess!) Thanks for this generous offer of a chance to win something so pretty! The fancy flounce is more popular than I thought it would be. [Not everyone wants to wear a flower on the back of their hand!] Thank you for throwing your hat into the ring! This was such an awesome post, I love every word. Opera music is spectacular, I love listening to it. It’s moving, powerful and peaceful, all at the same time. Thank you Derrick – I’m happy you liked it. Placido is one of my favourite tenors, though I have never seen him perform live or Cyrano..